I had a play today with a new stamp…my first one from The Stampsmith. back in the early 1900’s. and speechless…where we had to read the subtitles as we watched. This is where I took my inspiration from for this card. an aged, scratchy and vintage feel to it. and applied some Black Soot Distress Ink. Then I did some overstamping in the new Watering Can Adirondak Ink. To finish off I added some distressed bits of tissue tape to parts of the edge. Charlie has an ageless appeal. Next“Swept Off Her Feet” – CAS style! Super card with a great fun image. Thanks for sharing at Alphabet Challenge this fortnight. Hi Dot, Fabulous card. Love the background you've created, it's perfect for this image. 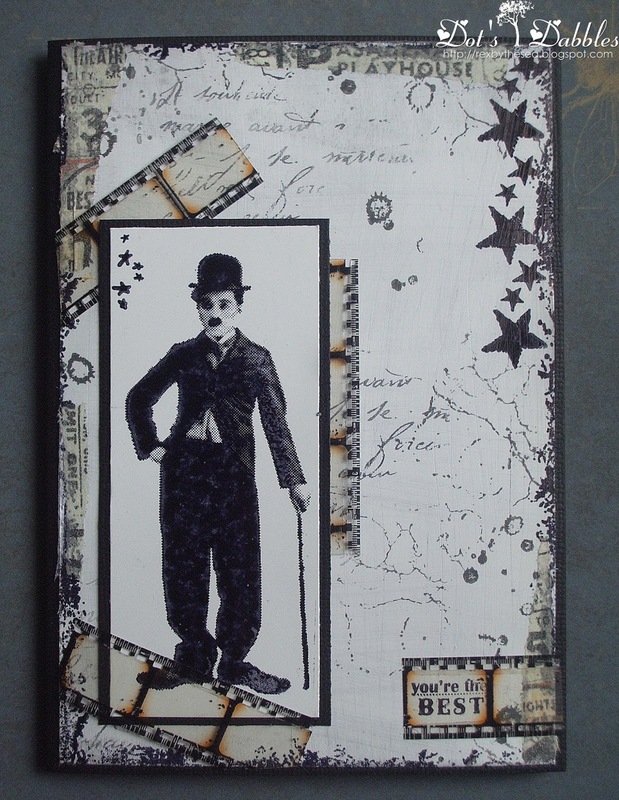 The film strip makes a great embellishment. Great use of Charlie. This is actually one stamp I don't have in my huge collection from The Stampsmith. 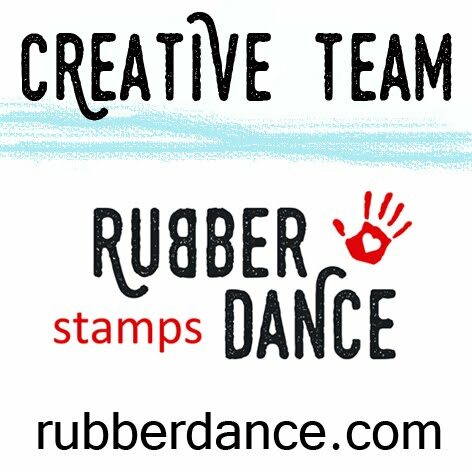 If you are ever interested, there is a monthly challenge at The Stampsmith Challenge – begins 1st of each month, runs for the full month and a great prize up for grabs. A pity this woudln't suit this month's theme (we are so lucky to have Paula as our Guest Designer). a totally cool and stylish card! A fabulous monotone card. It is super for this image of the old black and white movie star. Wow Dot this is amazing, I am so in awe of anyone that can make a photo stamp come out like this!! It looks fantastic, the monochrome background looks great and then the film strip is just the perfect finishing touch!! Oh nice job!! I think this is so artsy and fun. thanks so much for joining us this week at ATS&M. Very clever Dot, and so reminiscent of those early days of film, you have captured the feel perfectly. excellent card! what a fab stamp! Helloooo my very talented friend another card that has the wow factor. You have certainly captured the era with the look of this card. If it's your first from the Stampsmith be warned Dot, they are addictive. But great card using it and the monochromatic colours really lend themselves. Hi Dot, You are not in my column this week but as soon as I saw your card, I had to pop in and see what you had used for the CC image. I have been after an image like this for ages…years! TFS With my other hat on, thank you for playing along with the Addicted to Stamps Challenge. Sorry forgot to say in my excitement…Fabulous card. Really love it. Fabulous card Dot!! I love that image and the gorgeous vintage design! Thanks for joining us at Alphabet Challenge Blog! Fantastic card! I just LOVE it!! Thanks for playing along over at ABC Challenges! Fabulous card! I love the film strip ribbon! That's a wonderful card, looks really great. Love your b&w silent film homage… the film strips are very cool, and Charlie looks right at home! Great and beautiful card Dot with a lot of great details. Love your card! Great vintage feel to it and love the black & white too! I have your card featured in our winner's post this week, you were chosen our Facebook Favorite this week! Thanks for playing along with us at ABC Challenges! Dot, I just love Charlie! What a fabulous card and I love the filmstrip accents! I always slip and slide on glossy, so I do hear you! Enjoy the weekend!